Posted: Thu May 03, 2012 10:56 am Post subject: International Pre-paid Minutes Expired. "Your Prepaid minutes expire after six months of inactivity. While this has been part of our Terms of Service for years, we have just recently begun to enforce it. We regret any inconvenience this has caused you." Posted: Thu May 03, 2012 1:38 pm Post subject: Re: International Pre-paid Minutes Expired. The problem with this is that if effectively raises the price of MagicJack to 49.95/yr. I've ceased being complicit in the whole prepaid thing — because it's not just international. There are better deals. Why? 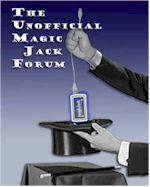 Because of another "thing" MagicJack does. Ever call a government number? They have high termination fees so MJ stops you from calling. That's not anywhere on the packaging. Or call certain weird counties in a state? Yup. Can't call Bumbleduck Kentucky, either. I was willing to let it slide on that, but now it expires. That's bullcrap. So you have to pay $10*2 every year if you need to call exactly 1 number 1 time in 2 different semesters of your year. Forget it. The terms have effectively changed too many times. The only thing I still like about MagicJack is the small ATA. But I'll live with an Obihai 101 and just pack that instead.